The Speedmaster of 1985 was already well-loved in press and on advertisements worldwide. The evolution from 321 to 861 Lemania-based movements with ‘professional’ dials and cases had been accomplished gracefully. The model line was a raging success. To celebrate the 25th anniversary of their role in the moon landing, Omega created a reference quite unlike any before or since. They created an 861 movement in a gilt gold, did away with all delrin components (went from 17 to 18 jewels), finished it in Côtes de Genève, and added a gorgeous engraved sapphire display back. The irony is not lost on me. This generation of Speedmaster featuring the easier-to-produce 861 movements are generally considered less impressive horologically than their 321 counterparts and are certainly more common. It feels anachronistic for Omega to apply such a haute, effortful finish to a relatively basic movement. This contrast is further emphasized by use of hesalite crystal on the face and sapphire on the rear (collectors will sometimes refer to it as the ‘Sapphire Sandwich’). The result is so off-brand for Omega of the 1980s that I can’t help but admire it. 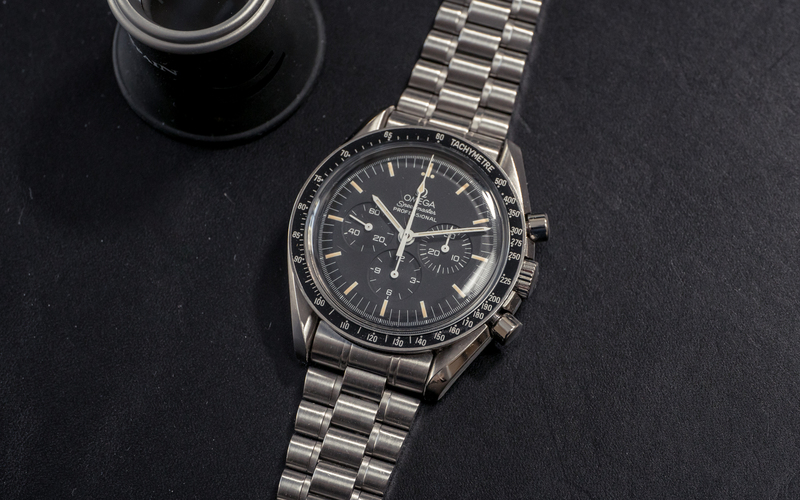 This Speedmaster 3592.50 Apollo XI is one of the earlier production examples. The dial and hands are finished in a tritium that has yellowed in age but remains largely intact. Later productions were finished in Super-LumiNova. The engravings around the sapphire inscribe “Apollo XI Speedmaster First Watch Worn on the Moon.” It comes on its original 1479 bracelet with 812 links. The case has clearly seen some polish, but nothing offensive. The watch was serviced last year at Omega. It comes without original box or papers but will ship in the Omega service case. It’s one adaptable, historically-significant, manually-wound, steel-sports chronograph. As it stands today, a huge value proposition.